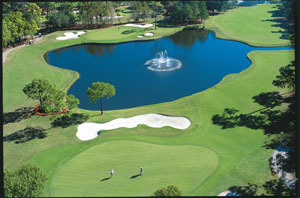 72 Holes of Award Winning Championship Golf and Home of the PGA Valspar Championship! The Innisbrook Golf and Spa Resort, just 25 miles west of Tampa, offers the perfect setting for families, golfers, or a romantic getaway. As you enter the gates, you experience a feeling that you've escaped to a remote setting, away from traffic, noise and the pressures of a hectic world! This 1,100-acre Innisbrook property features 600 luxurious guest suites; 72 holes of championship golf on four award-winning courses; a complete tennis, racquetball and fitness facility; a sophisticated meeting and convention center; plus outstanding dining in four restaurants, all just a few steps from your spacious suite. Guests enjoy six swimming pools, including the fabulous Loch Ness Pool and Spa, jogging and cycling trails, a wildlife preserve, and complete children's recreation center. Welcome to Florida's finest golf destination. At Innisbrook Golf Resort you'll enjoy 72 holes of championship golf, including the famed Copperhead and Island Courses, all just minutes from your suite. This premium golf resort also offers exceptional practice and instruction facilities, as well as three complete clubhouses featuring a Golf Shop, locker room facilities, and an attentive staff that understands just how to make your golfing experience the most rewarding you have yet to encounter. One round of golf w/cart per person per night stay including one round on Copperhead! 3 Days/2 Nights starting at $269* per player! EXTRA Day of Arrival Round + Breakfast! 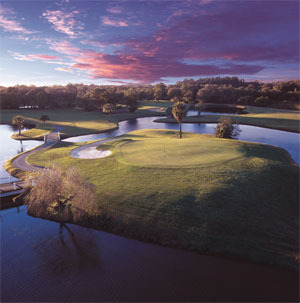 One round of golf w/cart per person per night stay plus golf on your day of arrival including one round on Copperhead! Rates are per person. Minimum 2 night stay required. Cart path only for The Champion. Forecaddies are mandatory on the Champion Course and are included in the surcharge and replay rates from Jan 01 – Apr 30, 2017. Gratuity included. Extra nights and golf available upon request. BLACKOUT DATES: Some blackout dates do apply. PLEASE NOTE: PGA National Resort now has an overnight parking fee of $10 per vehicle or $20 w/valet parking. This additional parking fee is NOT included in our rates. With its unusual elevation changes, the natural setting of the Copperhead course will probably remind you of a Carolina layout rather than Florida's West Coast. The Copperhead, of course, is ranked in "America's Top Resort Courses" by Golf Digest and No. 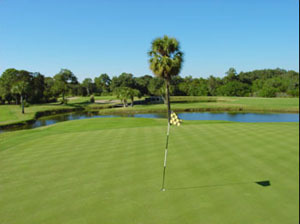 4 in the state by Travel & Leisure Golf's Florida's 50 Finest. From the tournament tees Copperhead presents a stern test of golf. At 7,200+ yards, this par-71 layout is designed to challenge the players of all ability levels. The Copperhead Practice Facility is located adjacent to the first hole and is complimentary to those with a tee time on the course. "The course is a daunting layout," says Chris Card, Director of Golf. "Larry Packard put together a stunning design...he combines narrow, tree-lined fairways with elevation change and very firm, fast greens. It's absolutely breath-taking from tee to green." The course opens with a par-5 (560 yards from the back tees and 450 from the forward) that is a sweeping dogleg right with a tee box perched some 50 feet above the fairway. The placement of the second shot must be accurate to set up a birdie chance here. One of the favorite holes here is the par-5 No. 5 (605 yards from the back tees and 465 from the forward). This is a hole that's challenging from tee to green. You'll be happy to walk away with a par on this hole. "It has a huge uphill elevation change from the tee to the landing area," says Tony Arielly, our director of group sales. "Then about 200 yards out from the green, it starts to drop dramatically back down. You have a blind shot for your second shot going over the hill. Then the green slopes away from you as you make your approach shot." Despite the difficulties, this is one of our most-photographed holes. No. 14, a par-5 that measures 570 yards from the back tees and 510 from the forward, is another of Lawrence Packard's famous double doglegs - one that goes right, left and then right to the green. It's definitely a risk-reward par-5. "If you can carry water on the right and avoid a massive bunker on the left, you may get a birdie," says Arielly. "You don't want to make a mistake on your second shot. There's a two-tiered green so if you're short, your ball could roll back down off the green. If you're long, it could roll the other way." 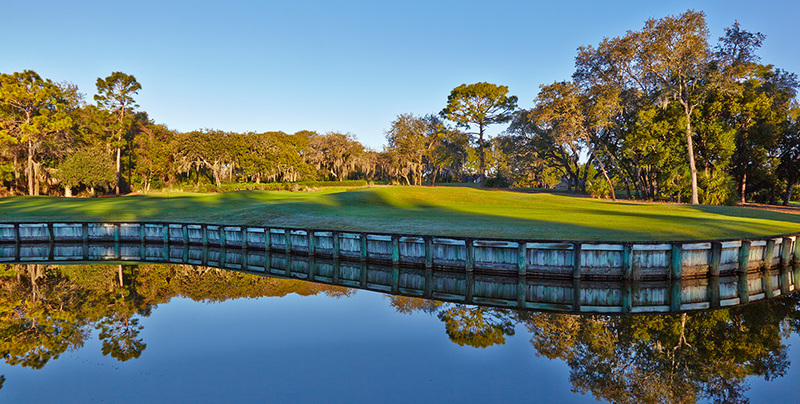 Ample water, tight fairways, intimidating hazards, and abundant bunkers -- all designed to test the skills of the most accomplished golfer have won much acclaim for the Island Course at Innisbrook. The Island, often considered to be just as challenging as the Copperhead, is ranked among the country's top 50 resort courses by Golf Digest and No. 14 in Travel & Leisure Golf's "Fifty Finest in Florida." The varying terrain, coupled with a variety of tee placements, can challenge both the professional player as well as the weekend golfer. The course has been a regional qualifier for the U.S. Open and is remembered as well for the NCAA championship that Phil Mickelson won here in 1990. 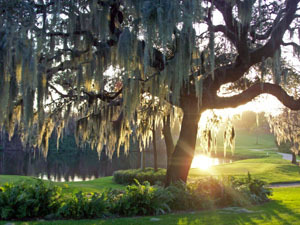 One of Innisbrook's four championship courses, the Island Course, was the first to open for play in December of 1970. There are 18 truly unique holes here. "This is a long par-72 course with water in play on at least half the holes," says Brock Nicholas. The Island offers enchanting, picture-postcard scenery. "You'll find tall pines draped with Spanish moss," Nicholas says, "and lots of serene views. I love the Island Course. It's tighter off the tees and just as tough as the Copperhead. You need to be straight here." The Island's first six holes are dominated by lateral water hazards and fairly level terrain which require pinpoint accuracy on both tee shots and approaches. The middle six holes feature rolling hills dominated by cypress and pine trees. The final third of this course boasts a mixture of holes designed to reward the bold yet penalize the errant golf shot. The golf course winds down to a finishing hole that will test the nerves of even the most steady player. Your first hole is a par-4 (372 yards from the back tees and 322 from the forward). It's dogleg right with a well-protected green. Water runs along the right side of the hole and there are bunkers on both sides of the green. But this opening hole is a birdie opportunity. The signature hole on this course is No. 7, a par-5 dogleg-left that plays at 565 yards from the back tees and 467 from the forward. This could be the most treacherous test you'll face on the Island. "This is a very tight driving hole," says Nicholas, "with water and trees on the right. The second shot is tight as well with a lake on the right." Keep in mind on No. 7 that from the fairway to the green, the ground rises uphill about 60 feet. There's a green here that's well-protected with multiple-lobed bunkers. The No. 9 hole on the Island Course is another toughie. "It's a par-4 that plays 415 yards from the back tees (329 yards from the forward). It's a dogleg left, but it's easy here to run through the fairway and into the woods if you're too daring off the tee," says Tony Arielly. Your approach shot on No. 9 requires a shot over water to a green that's surrounded by bunkers. The finishing hole on this course is very similar to No. 9 in its layout. It's also one of the most photographed holes in the state of Florida if not in the nation. "It's a narrow dogleg-left par-4 (370 yards from the back and 290 from the forward tees) with trees on the right side and lots of water on the left," says Arielly. "There's also water in front of the green. You need to use a fairway wood or a long iron off the tee to try to hit around the corner. It's a make-or-break hole." On this hole the green also slopes toward the water. This beautiful 18-hole layout features tight fairways and well-bunkered greens, placing a costly premium on accuracy from tee to green. Recent course improvements include longer, more challenging par-4s and -5s with added bunkers and waste areas to create greater penalties throughout for those errant approach shots. This course is known for its daunting par-3s. "This is known as a shotmaker's course," says Tony Arielly. "There's definitely a premium on accuracy and not so much on distance." Also designed by Lawrence Packard, the Highlands North at Innisbrook is similar in terrain to the Copperhead Course, but not in length. Rolling fairways and water throughout make club selection your most important strategy on this course. About 6,600 yards from the back tees, this course is known for its long par-3s and small greens. Ball placement becomes critical. Although it's our shortest course, it's one of our most challenging. In fact, 11 of the 18 holes here have water on them. The other seven have narrow fairways with lots of trees and bunkers. The signature hole here, says Brock Nicholas, is No. 3, a 470-yard par-4 that is a tight driving hole (345 yards from the front). "It's straightaway, but there's water on the right and left and rough farther down on the right. Then you have a long carry to a partial island green." You will need a long and accurate drive to get started on this hole. One of the most scenic holes here is No. 5, a dogleg-right par-4 (410 yards from the back tees and 300 from the forward) that curves around the water. Your second shot has to take you onto an island green. "Whenever you say the words 'island green,' it puts fear into the heart of golfers," says Arielly. "On top of it all, you can't see the island green from the tee because this is a pretty sharp dogleg. You have to hit down a chute of trees off the tee. If you go too far right, you're in the water." No. 8 is an excellent par-5 (510 yards from the back tees and 425 from the forward). It's a 90-degree dogleg right uphill with a river running across the fairway. Golfers who like to gamble will love this hole, especially if they can hit the ball well. "The brave will use their driver off the tee to try to go over the river," says Arielly. "But most golfers will lay up in front of the water and then go uphill. On the second shot, you start all over again by trying to hit a cut shot over 50-foot trees." No. 14 is one of Arielly's favorites. It's a par-4 dogleg left that measures 400 yards from the back tees and 320 from the forward. You hit off the tee to the landing area through a tunnel of trees. Your approach shot requires hitting over a river and lake combination that goes all the way across the fairway. "If you hit a bad drive, you may have to lay up short of the water and take a third shot over the water," he says. The Highlands South Course stretches almost 6,800 from the back tees, this course features the longest Par 5 in the state. Highlands South promises undulating terrain and elevation that brings the wind into factor when making club selection. Ample waste bunkers and 10 water hazards offer a great challenge. This course is almost a links style, says Tony Arielly, both in its set-up and the way it plays with its fairway bunkers and rolling terrain. You'll get off to a moderately easy start with a straightaway par-4 that plays at 335 yards from the back tees and 250 from the forward. You do have to avoid a large bunker on the left and trees on the right. There's a great par-3 on the third hole that measures 180 yards from the back tees and 100 from the front. 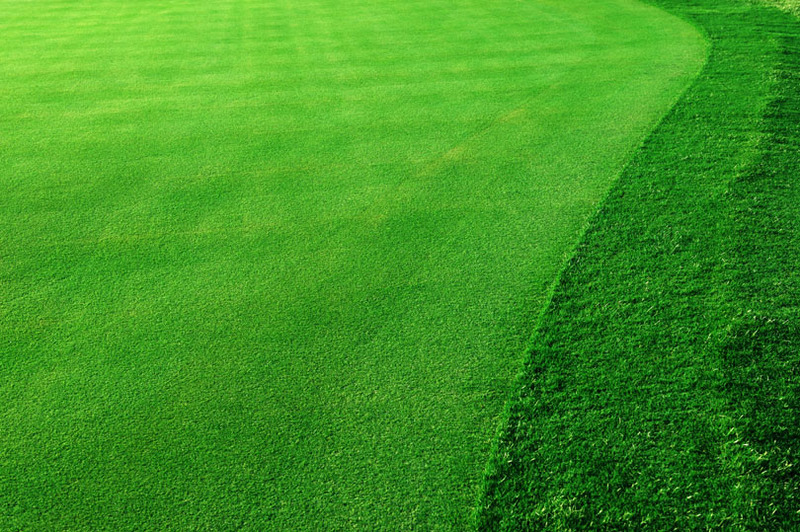 This hole has a very narrow green that measures about 40 feet at its deepest point. There's plenty of water in front of the green. Accuracy and distance control is very important here. "If you're short, you'll end up in the water. If you're long, you'll be in the back bunker," says Arielly. The No. 9 hole on this course is also a challenging par-3 that plays at 210 yards from the back tees and 160 yards from the forward. It's not a true island green, but it's surrounded on three sides by water on the sides and in the back. It's a peninsula surrounded by bulkheads. You have to hit a very straight shot to this large, two-tiered green that slopes back to front. This hole is definitely affected by the wind in front of you or behind you. It's all carry here, although short of the green is a lay-up area. Our No. 13 hole on the Highlands South is the longest par-5 in the state of Florida. The back tees are placed at 630 yards; the forward at 450. The back tees are only for the strong-willed player on this double dogleg. The difficulty here is mostly in the length and in the moguls that will bump your ball up and down the fairway. A nest of fairway bunkers guard the approach area on your second shot. There's not a flat lie anywhere. "It's a long shot into the green on your third shot," says Arielly. No. 18 is a picturesque par-3 finishing hole (185 yards from the back tees and 150 from the forward) that requires a medium to long iron shot over water to a deep green. 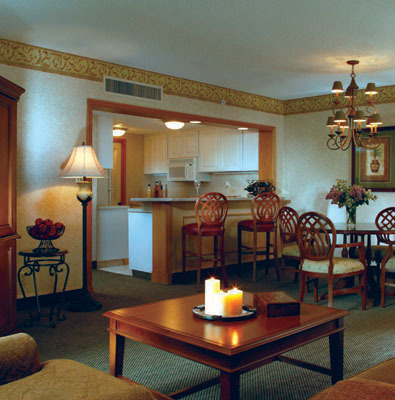 The warm, hospitable style of the Innisbrook Resort experience is furthered by our guest accommodations. They are spacious; and gracious. And they are not just rooms, but suites, 600 in all, with a choice of four different layouts. 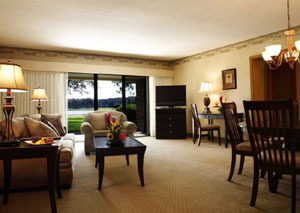 Guests at Innisbrook can also enjoy beautiful suite accommodations. Each of these luxurious, modern suite residences offer a complete kitchen, private balcony or patio, separate living area and the very luxurious Innisbrook Resort Heavenly Beds. The One Bedroom Suite consists of a spacious living room and a separate bedroom. It also has a built-in bar and fully equipped kitchen and features a private balcony or patio. (980 sq. ft.) Pull-out couches are also available in most units. This service is available through our Service Express Desk (24-hour advance notice is suggested for the service). Innisbrook's food and beverage services are also available to our guests from 6 a.m. to midnight. Whether it be in the privacy of your suite or while relaxing poolside, our staff will be ready to serve you. In-suite beverages and snacks are available. Through Innisbrook's Catering Office, guests may make complete arrangements for goods and services involved with the entertaining of small groups in individual suites. While each lodge building is equipped with complete laundry facilities, professional laundry or dry cleaning services are available for same-day return through the Bell Captain. A licensed Massage Therapist may be scheduled 24 hours in advance. Complimentary issues of USA TODAY are delivered to all guest rooms each weekday. Lock boxes for all guest valuables are provided at the Front Desk in the Reception Center. Telephone information regarding local, in-house and long distance service can be found in the in-suite Guest Directory. Cable television is provided in each guest unit, with Spectra-Vision movies available for viewing. For on-property transportation, Innisbrook provides a climate-controlled tram system that runs continually between the lodges, Clubhouses and the Convention Center area. Enjoy any of six swimming pools located throughout the property. 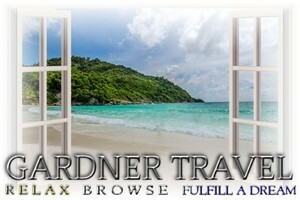 All are temperature controlled and equipped with lounge furniture and guest bathhouses. The Copperhead and Island pools also include a hot tub for our guests' enjoyment. Our largest pool, The Loch Ness Pool & Spa, is located in the center of the Resort in the midst of a three-acre fun park. Loch Ness offers two sand beach areas, a plunge pool with bubbling jets and fountains, a 15- foot waterfall, two large, winding water slides, a pavilion grille for pool-side dining, sunbathing areas and a monster-sized spa, seating up to 36 persons! This Summer the kids are sure to enjoy the many pool-side games and activities, hosted by our friendly staff! The entire Loch Ness complex is designed with a very natural feel to complement the resort's existing lush landscape and wooded acreage. Because of our special concern for the environment, design centers on conservation of existing green space, mature pines and magnolia trees. Pool towels are available at The Loch Ness Pool & Spa, in addition to swimwear, suntanning lotions and other items you might need to purchase during your stay. Not only does Innisbrook boast championship golf and tennis, but we also have the most progressive Recreation Department in the resort industry. Our staff of professionals has the expertise to provide you and your group with exciting activities to highlight your meeting, or just enjoy during your stay. Fitness Center: Located in the Tennis Center, the Fitness Room offers a complete line of Combi Equipment for a safe and effective work-out. Bicycles, stair climbers and free weights are also available. Corporate Fitness Programs are also available for groups of all sizes. Ask for a copy of our Corporate Fitness Brochure from your Sales Manager. 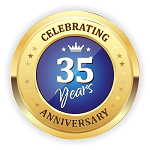 Lynn Colombo, our onsite certified personal trainer offers a variety of fitness classes and personal training programs towards health and wellness. Our Resort features 11 HarTru courts, with seven lighted for night play. For beginners and advanced players alike, our superb professional staff offers great instruction, too. The tennis center includes a pro shop, indoor racquetball courts and complete fitness facilities. Basketballs and volleyballs are available at the Tennis Center for individual practice and intramural play. We offer over six miles of roads to peddle, all in the natural beauty of Innisbrook. Bikes can be rented out for several days, in which case we will issue locks and chains for the bikes. Fishing: Rods, reels and tackle are available to catch the "big one." We stock fresh water catfish, bass, and blue gill in Lake Innisbrook. Sport fishing in the Gulf of Mexico may be handled on a charter boat basis through the Transportation Department. Stroll down Innisbrook's Nature Boardwalk while enjoying the tranquility of the cypress marsh reserve and wildlife sanctuary. This boardwalk allows guests to experience Florida in its natural state. The sanctuary is home to a variety of wildlife including Snow-White Egrets, Long-Legged Herons and Red-Headed Woodpeckers. The nature boardwalk is located near the Reception Center and is open sunrise to sunset, daily. Complete facilities are located in each of the three clubhouses and are available to all resort guests. After a great workout, consider a relaxing massage or saunas are available at the Island Clubhouse, as well as outdoor Jacuzzis at the Island and Copperhead Pools.